Are you familiar with CALs (crochet-a-longs)? CALs are organized groups of crocheters who often crochet the same project at the same time, kind of like a group of people crocheting together in person! However, many CALs are held through cyber-space instead of in person! Some CALs are held for a specified length of time and some are ongoing. But one thing that is common to all CALs is encouraging each other and helping each other with our projects. Questions are very common about what yarn/thread to use, the pattern and more. There’s lots of sharing going on in CALs, too. KALs are much like CALs, except KALs pertain to knit patterns, not crochet patterns. If you read last week’s blog post, you’ll know that I started a Ravelry group as one of my New Year’s resolutions. In that new group, I’m holding my very first CAL (in time for Valentine’s Day!). Around 10 Ravelry group members will be crocheting my Filet Heart Coaster pattern, starting next week and running until Feb. 14. And I’ll be there to answer any questions that may arise while these participants are crocheting their coaster(s). This coaster is crocheted in the filet crochet technique and has 2 layers for added absorbency. If you would like to learn to do filet crochet, this is your chance! I’m discounting the cost of this pattern by 50% for CAL participants, too. So for less than $2, YOU can learn to do filet crochet! I’ll be crocheting along with the other group members. I decided to make my coaster larger with some Omega Sinfonia yarn instead of using size 10 crochet thread. It’ll be interesting to see what size it turns out! I think it’ll be potholder/hot pad size, which will be nice! If you’d like to join my Ravelry group and participate in this CAL, I’d love to have you join us! You can find the group on Ravelry here. Why not take the first step and learn your first crochet technique this year? 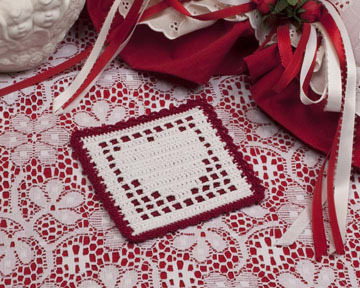 This entry was posted in CAL, Crochet patterns, Crochet technique, Filet Crochet, Holidays and tagged CAL, crochet techniques, filet crochet. Bookmark the permalink.